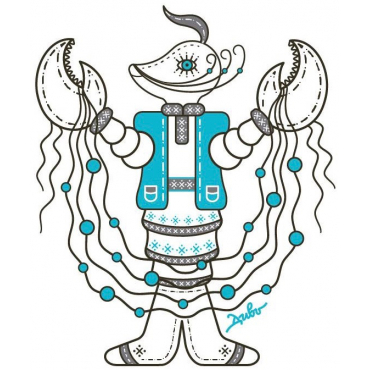 Meaning "Horoscope crawfish - a brave cossack"
The Horoscope Crawfish is a new hero in Dyvooo collection. Say what you wish and it will help you to realize your dream as soon as possible. Our hero’s story begins in ancient times. It is one of the oldest creatures on our planet who survived till present days. The Crutacean family contains 73 000 species which settle most continents, seas and rivers. Some of them are very small and can be visible only with help of microscope while others are very big and delicious. Most of them live in water. However there are some terrestrial shrines and even fossil creatures. Our crawfish has several symbolic lines. First is connected with brave Cossacks who defended our Motherland from bloody enemies. This image is actual today because part of Ukrainian territory is occupied with foreign troops. The second line is zodiac. Cancer is a fourth sign in traditional horoscope. The people who were born between June 22 and July 22 are brilliant spouses. They admire the comfort of a home. The Cancerians have strong memories and passion to discovering the ancestors history in their families. And the latest symbol is its artistic nature. We meet different kinds of crawfishes, shrimps, lobsters, krills etc. in various paintings, animations and movies. Together with Swane and Pike this creature forms a triangle of confrontations which pauses the development of individualities and whole countries. The Horoscope Crawfish accessories are compatible with all palette of dresses or blouses. 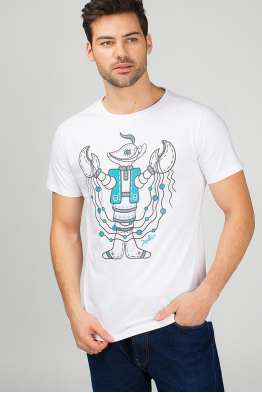 Build your personal collection of "Dyvooo-animal" and "Dyvooo-eyes" starting with Crawfish illustration. Just choose your items! 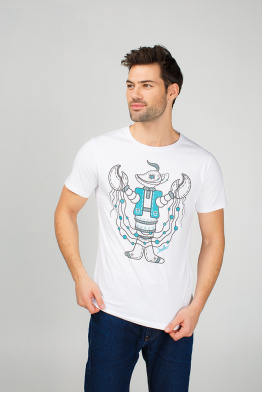 Men’s t-Shirt "Horoscope crawfish - a brave cossack"